The perception across America is that California is the state people are leaving. And that perception is accurate. More than 1,000 people each day are leaving leftist sh*thole blue states and moving to red states. “This migration is changing the economic center of gravity in America—moving it relentlessly to the South and West,” according to economist Stephen Moore. “California is one of the oil- and gas-richest states in the nation,” which should mean a mass inbound migration, “but its ‘green’ politicians are regulating that industry out of businesses. So much for caring about working-class Americans,” Moore says. And why is that? millennials, the fuel for tech firms, also may not be as urban-centric as some have predicted. Their numbers have recently dropped or plateaued in the much-celebrated core cities of Boston, Chicago, Los Angeles and New York after rising earlier in the decade. In contrast, many Sun Belt areas – Nashville, Charlotte, Houston, Dallas-Fort Worth, Austin, Orlando – enjoy stronger net population growth in those between 25 and 34 than coastal California and the Northeast. 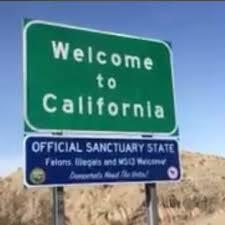 California’s problem is not just people leaving, but talented young people not coming here who, years ago during our better days, streamed in. My own millennial son, a Naval officer, recently transferred bases from San Diego to Virginia, and said he wished he’d made the move a few years ago. While not exactly a super low-tax state (but ranked 31 in the Tax Foundation’s 2018 State Business Tax Climate Index, Virginia is much better off than CA’s 48th ranking), cost of living, open carry laws, and general non-California people and attitudes contributed greatly to his opinion. He spent his first 18 months out of the Naval Academy in northern Florida, and appreciated the low-tax, business friendly state so much, he’s maintained his residency there. According to the 10th Edition of Rich States, Poor States: ALEC-Laffer State Economic Competitiveness Index for 2017, California ranks 47th in economic outlook. Why? The ALEC report was for 2017. Since the report was published in April, California’s lawmakers and governor have been hard at work further destroying the economic outlook for the state. Most recently, the state Public Utilities Commission’s decided to close Diablo Canyon nuclear power plant, marking the end of more than a half-century of nuclear power generation in the state. This will only serve to dramatically increase our energy costs, which are already the highest in the nation. Data from the U.S. Energy Information Administration showed California households paying 17.97 cents per kilowatt hour for electricity, or 40.9 percent more than the national average of 12.75 cents, CNBC reported. California isn’t Norway, which is the world leader on using electric cars. And that is because it’s freezing cold and frozen in Norway, which relies almost entirely on hydroelectric power. Um, with our Mediterranean-like climate, warm, dry summers and mild, wet winters, California isn’t Norway. And the leftists in California hate hydroelectric power anyway. Stay tuned for Part ll of How California Democrats Have Turned The Golden State Into A ‘Sh*thole’ later this week.